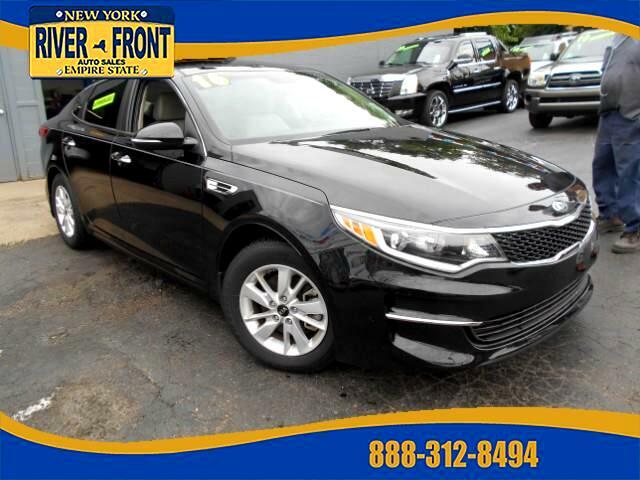 The Optima was redesigned for 2016, and Kia has made many changes aimed at improving handling and comfort while reducing noise, which means the Optima is more pleasant to drive than ever. A new 1.6L turbo is the new entry-level powerplant and comes connected to a new-for-2016 7-speed dual-clutch transmission. Kia's UVO infotainment system has been revamped and includes several new features aimed at parents of teen drivers. THIS VEHICLE COMES EQUIPPED WITH air conditioning, climate control, tinted glass, am/fm stereo on wheel, cd player, interval wipers, ABS, power door locks, child proof locks, power windows and mirrors, garage opener ready, cruise control on wheel, tilt steering wheel, keyless and lighted entry, remote trunk, interior button trunk and fuel, passenger air bag, security system, rear defroster, side air bag, front bucket seats, console, carpeting, cloth upholstery, traction control, power outlet, message center, lighted vanity mirrors, compass and temp, bluetooth, satellite, cup holders, map lights, phone ready, and phone on wheel.